If its Friday this must be Denton, Texas. In the quest to escape the northern cold our spring break roadtrip finds us in Denton, Texas. 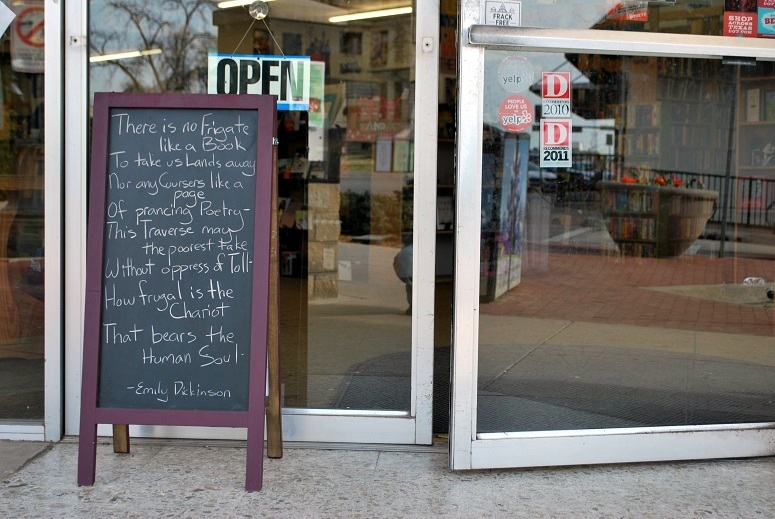 In wandering the town square of Denton we came across Recycled Books and their sandwich board out front quoting Emily Dickinson. Inducted into the American Poets Corner in 1984, Emily Dickinson was one of the first three American poets to be so honored alongside Washington Irving and Walt Whitman. Though No Frigate Like A Book is one of Dickinson's best known poems it began its journey to immortality as a mere passage in a letter written by Emily in 1873.